As a tangible and definitive contribution to this 2nd Sustainable Development Goal that was universally acclaimed along with 16 other goals in 2015, India’s largest multinational flexible packaging materials and solution company under the aegis of Ashok Chaturvedi has come up with Flexfresh that works on the principle of Active Modified Atmospheric Packaging (AMAP) Technology. 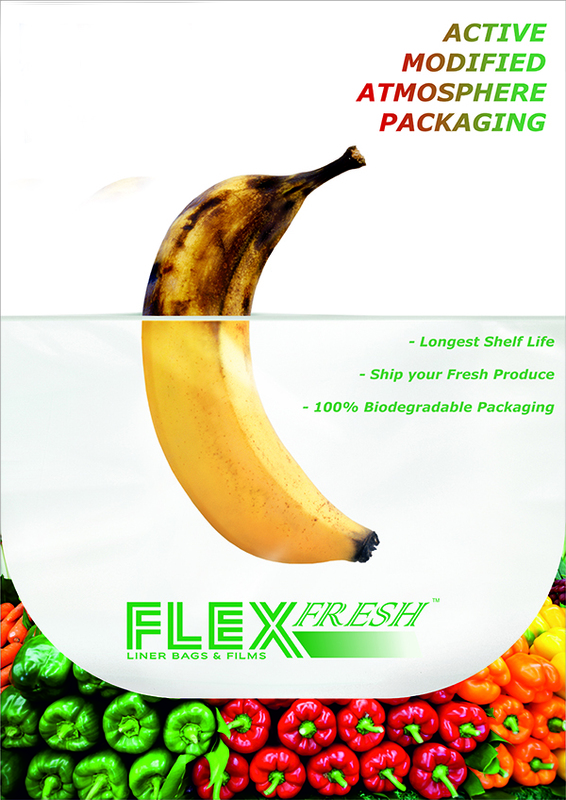 Flexfresh is a special patented film made of proprietary polymeric composition that elongates the shelf life of highly perishable fresh produce like fruits, vegetables and flowers. Flexfresh as a packaging solution will be on exhibit at ANUGA FOODTEC 2018 in Cologne, Germany at Hall 8, Stand F-035 from 20-23 March 2018. In Flexfresh, equilibrium of oxygen and carbon dioxide is maintained at all times while restricting the humidity between 90-95% to avoid condensation. The effect of ethylene emitted by the produce is greatly reduced during ripening amidst high humidity.The bag exhibits good carbon dioxide release characteristics. Neither gas flushing nor compressed vacuum technique is used here. The amount of oxygen required by the product is the key point of the packaging. This is controlled by the perforation. The micro-perforationrequired is decided on the basis of Oxygen and Carbon Dioxiderequired inside the bag. Flexfresh is the first ever film for packing fresh produce that is bio-degradable by composting and complies with all international regulations for overall migration (EC 1935/2004), reach compliance (EC 1907/2006) and qualifies for biodegradation under DIN EN 13432 (2000-12). Citing a few success stories, Siva Shankaran said, “A leading Dutch Bell Pepper exporter commenced shipping his produce to USA by sea containers in 2015. The exporter was happy with the arrival quality and exported over 300 containers from Holland to USA in 2017 after conducting successful trials by sea container earlier in 2015. An Indian Pomegranate grower has been supplying its produce to Europe. Extensive trials were conducted during 2015 and in 2017 over 300+ containers of pomegranateswere exported to Europe and other countries, to leading super markets with excellent quality upon arrival. A prominent European Retail Chain conducted a litmus trial with Flexfresh bags by shipping Blueberries from South America to Europe. This journey usually takes more than 5 weeks by sea. The results have been more than austounding. While the loose blueberries resulted in an average weight loss of 19.96%, those packed in Flexfresh had shed merely 0.76% weight after a period of 7 weeks, thus registering a phenomenal 96% reduction in weight loss upon arrival.